Modern steelmaking method including the electric steelmaking converter steelmaking two method. 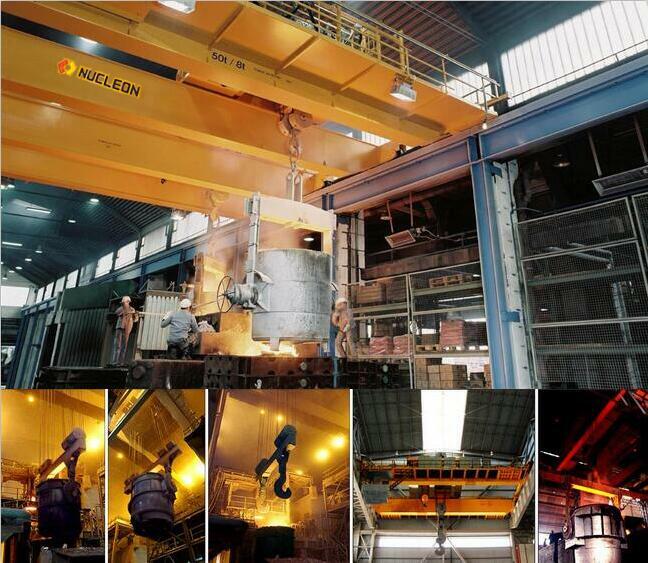 Electric furnace Rolling Crane structure is similar with some casting crane. Since the crane lift the non-liquid metal, the biggest difference with Rolling Crane design conditions, for design is that the main lifting mechanism does not consider the stand-alone work ,therefore, the choice of motor of power is smaller than casting crane. The charging crane working environment is harsh, high-temperature, high dust; high level, fully loaded rate and frequent work. Due to steelmaking way different, charging crane type is different. charging Rolling Crane have furnace charging Rolling Crane and converter chargingRolling Crane two type. Use various speed system with speed ratio as 1:10 for main mechanisms such as hoisting, trolley traversing and crane travelling. Also we can choose the suitable speed under the customer requirement. Power Source:3ph,380V,50HZ or other under customer requirement. We strongly believe in Design and Development for the improvement of the products to save power and money. We have a wonderful team for Quality Assurance and set to achieve higher goals and conquer new horizons.